ST. PETERSBURG, Fla. (January 22, 2018) — Many doubted, said it couldn’t be done, said it’s not time. There were several concepts in the former Howard Johnson hotel, on busy Fourth Street, across from a sometimes-beleaguered Williams Park. The Galley’s founders, St. Pete natives Pete Boland & Ian Taylor, have found success in their concept and vision for a local-themed tavern with a welcoming vibe. Celebrating their grand opening a year ago this week, The Galley – “a St. Pete Tavern” – found immediate popularity among a wide spectrum. It’s common to bump into elected officials or business leaders, just as it is good-time enthusiasts and foodies. “From young professionals to retirees, sports fans, artists, traders, collaborators, leaders, breeders, readers, smokers, jokers… Students meet seniors, neighbors meet visitors – it’s a cool mix, it’s St. Pete,” said Councilman Charlie Gerdes. “The Galley is a meeting-place by day and a go-to evening venue. It sounds silly to even use the word Cheers in any statement about a bar. But, it has that feel for many of us,” added businessman Justin Bean. 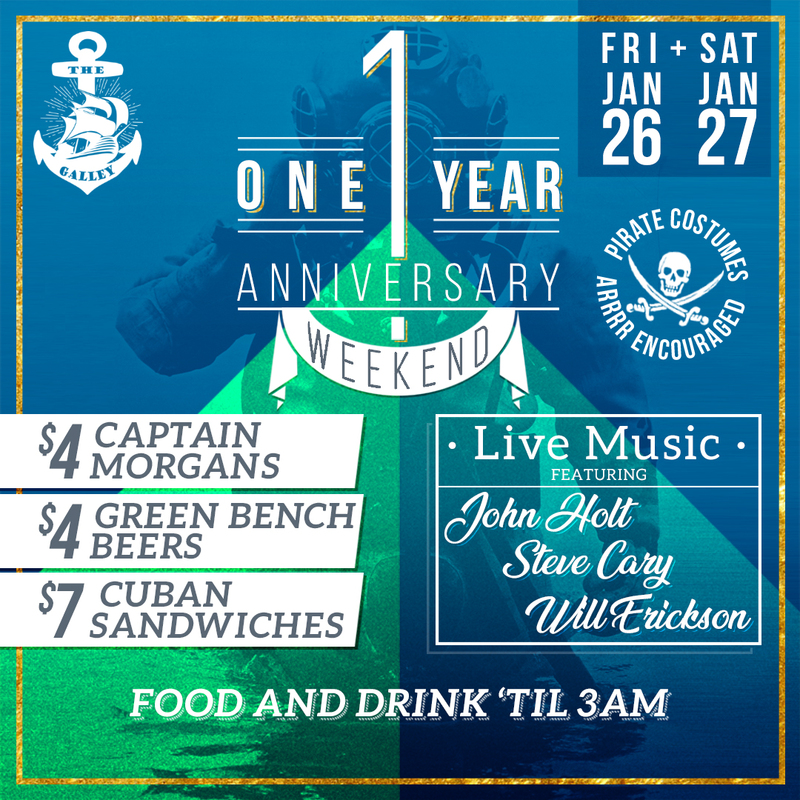 To celebrate and show appreciation for patrons, supporters, and community partners, The Galley is throwing a three-day party, January 25-27 – “Gasparilla St. Pete style” – which is kinda similar but less traffic and more bathrooms, still pirate-themed and “costumes encouraged!” Businessmen and philanthropists John La Budde and Brendan McCarthy host the “Second Annual Gasparilla Shipwrecked Party” on Thursday, January 25, kicking off the Thursday-Saturday festivities. A nautical-inspired, locally owned and operated full liquor tavern, serving the best in St. Pete food, drink and culture. Located at 27 Fourth Street North, The Galley is open 11:30am to 3am daily, with late-night menu 11pm to 2:30am. Bar includes local options along with full liquor and wine list. Information/updates are available at TheGalleyStPete.com, Facebook, and Instagram.